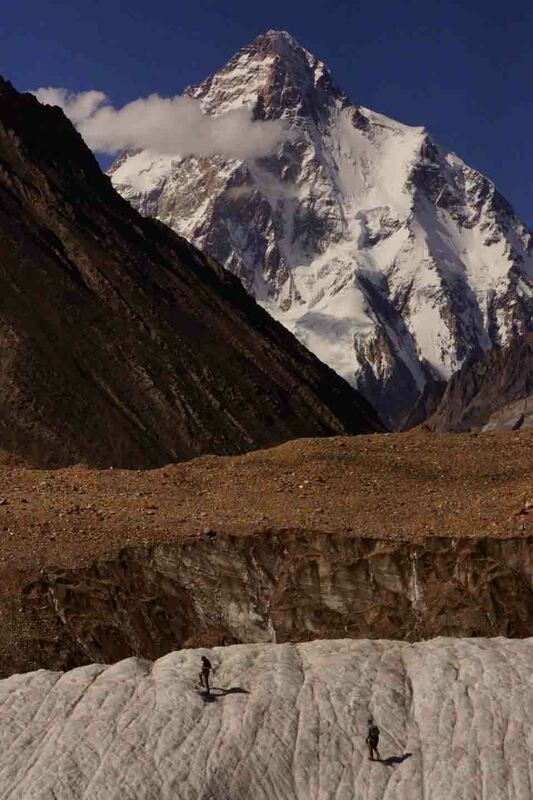 K2 Basecamp and the Gondogoro La “Trek”. Aug 2012. “I’m going to Pakistan Babe” I excitedly told Jane: she looked as if I had told her I had some kind of terminal disease. Like many she was lumping Pakistan into what Captain America and his western allies refers to as the “Axis of Evil”. Yes it undoubtedly has its problems, generally due to its proximity to Afghanistan and its unresolved border dispute with India but as I was to find out this accolade could not have been further from the truth. The Mountain Company http://www.themountaincompany.co.uk had asked me to lead their expedition to the Karakoram this year so leaving from T4 on a stupid o clock flight I exited at the halfway stage into the hair-drier heat of Kuwait. The airport there was like a giant chessboard, The men were all in resplendent white robes and taquyah and their wives were all burquared up in solid black, if only the floor had been black and white squares it would have been perfect. Six hours or so later the plane spewed me out into the sweatbox humidity of Islamabad. I was expecting a typical Indian type city (overcrowded, chaotic, dirty and polluted), surprise again, Islamabad is modern, clean and well organized. My taxi took me on the Islamabad expressway into the city and to the guesthouse, hardly any other traffic on the road, clean sidewalks, little or no litter and no crazy crush of incipiently suicidal drivers in vehicles that should have been condemned after the Second World War. I slept for almost all of the next day in air-conditioned luxury, and then on the next I met the rest of the group (who arrived on different flights from various parts of the world), We had a meal in the obscene opulence of the Serena hotel, visited the largest mosque in the world and were just generally bowled over by the politeness and helpfulness of the Pakistani people we met. 50% of all the flights from Islamabad to Skardu are cancelled, leaving the unfortunate and stranded travelers no option but to drive for 48 hours on the KKH (Krakorum Highway (also called the 8th wonder of the world)). It’s a one-hour flight or two-day drive!! Our luck was in, the plane turned up (usually the first obstacle) and the weather was clear (the second obstacle) and an hour later we were in Skardu and the K2 Motel. Skardu sits on the mighty Indus River and is the main jumping off spot for the Karakorum; the K2 Motel is generally where every major expedition stays before heading off to do battle with some of the most remote, biggest and most difficult mountains in the world. The walls of the hotel are lined with the posters and paraphernalia of a multitude of previous expeditions full of famous names from every corner of the world. I felt like a bit of a charlatan in such eminent company. 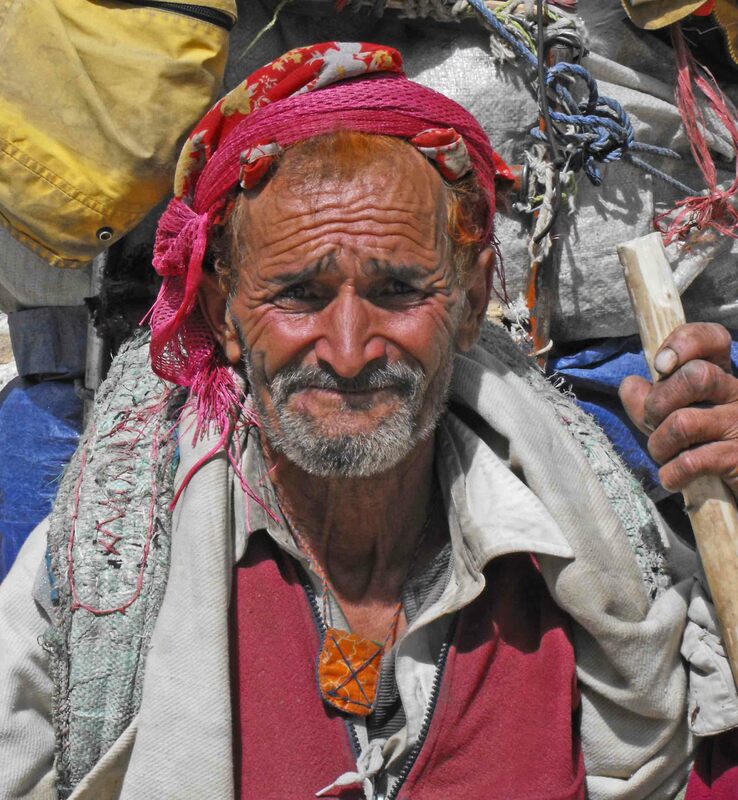 The town itself is dusty, windswept and feels like a bit of frontiers land, a walk down the main drag leaves you with no doubt that you are now in a world of Islam, there are no women out and about (with the exception of a few tourists), it’s a world of men and boys. The mosques vie with each other several times a day over the call to prayer like so many blackbirds singing in a slightly different language but again, dusty and third worldly though it is it is clean and tidy and you are treated with respect and helped, even when you do not know you need it. In the morning we boarded a couple of four wheel drives and set off for Askole and the start of the trek. The road follows then crosses the Indus into the Shigar valley. It is little surprise that a similar valley ( Hunza ) inspired the story of Shangri-La, The Shigar valley is an oasis of green and fertile fields surrounded by white-topped mountains that disappear into almost unimaginable heights. We drove past groups of kids in crisp white (for the girls) and blue (for the boys) uniforms walking along the road to school. Apricot trees heavy with fruit lined the roads, and the fields on either side were full of crops awaiting the communal harvest; it is difficult to imaging a better image of agrarian perfection. It was not to last: the metaled road deteriorated into a rough track that was hewn out of the side of a steep pile of choss. The river Baltoro, which the road followed, transformed itself into an insane, roaring and churning mix of grey colored mud and water. The track, along which the jeeps drove, was at times precariously perched on angled (the wrong way) choss above this maniacal torrent. The drivers seemed to prefer a speed that just crossed the “I’m comfortable with this” line and some of the bridges we crossed needed running repairs as we went. An eventful (and alarming) journey to say the least and we hadn’t even started walking yet. Late afternoon we reached Askole (and a degree of salvation) and our first night under canvass/nylon. Next morning, our 34 porters and 6 support staff organized, we set off for Concordia, eight days away. The first day was a fairly level walk alongside the now much wider and braided Baltoro river. The sun was brutal and the temperature well into the thirties and by the time we reached Jhola (7 hours later), we were all pretty frazzled and ready for a refreshing shower under a pipe fed from a very cold mountain stream. The unclimbed fang of Bakhor Das bathed in the early morning sun taunted us from the other side of the river as we set off for the next two days trekking which largely continued in the same vein. However by now the valley had narrowed and the white snow capped peaks on either side were rising higher and higher as we progressed. The weather after this started to deteriorate to grey skies and low cloud, this was a blessing in disguise at it kept the temperature down but denied us clear views of the Trango Towers and the Cathedral Spires which we had frustrating glimpses of through the wispy cloud. By this time we were walking on the Baltoro Glacier proper, it’s one hell of a big pile of rubble and ice, the going was tough, the trail deteriorated into endless piles of loose boulders. Many smaller side glaciers fed into the main Baltoro making it a convoluted, twisted and difficult pile of boulders to walk along. Five days of this (including a rest day at Urdukas), enough to test the patience, legs, balance and mental stamina of most, eventually brought us in increasingly heavy rain to Concordia. Concordia is where the Baltoro, Abruzzi and Godwin Austen glaciers meet, these in turn are fed by a myriad of smaller (they would be massive in an alpine context) glaciers, it is called the “Throne Room of the Mountain Gods.” Today however, it looked like the dumpsite of the mountain despoilers. We walked past a large pile of soggy garbage, and as we entered the camping area the cloud was almost on the ground and the rain was persistent. Was this what we had walked through eight days of rubble hell to see? The next day we were due to walk into K2 basecamp but the weather remained somewhat Scottish so we binned the idea and sulked in our tents listening to the tortured ice groaning and creaking below our thermarests, By early evening however blue spots were evident in the skies above us and the peaks around us were starting to reveal their secrets like so many shy virgins shedding their seven veils. Rising at 0400 the next (frosty) morning we were greeted with clear skies and one of the most amazing 360-degree mountain panoramas I personally have seen. To the north the Goodwin Austin glacier led the eye past Marble peak on its left and Broad Peak on its right towards the uncompromising ridges, icefalls and seracs of K2. To the East Gasherbrum led the eye down the Abruzzi glacier towards the Siachen and the disputed line of control with India. To the south the view was dominated by the (somewhat South American looking) snow fluted ridges of the Vigne peaks whilst Mitre peak took control of the near distance. The Baltoro glacier that we had labored up for the past few days led the eye to the east back down the valley to the distant spires of the Trango Towers, which were glinting in the first rays of the morning sun. We breakfasted, crossed a rather slippery lump of white ice and started our walk up to K2 Basecamp. The sun came up and we started to bake, we passed Broadpeak basecamp and continued up the glacier towards K2 and its lovely neighbor Angel peak. I made a small navigational mistake and ended up at the Gilky memorial on the wrong side of the river for getting to the basecamp proper. However with some help from the cook at basecamp and a little bit of a fraught river crossing we were in basecamp (having a cup of tea with the cook) by 1300hrs. The walk back was tedious, all in all the round trip took twelve hours, twelve hours of walking on difficult rocky terrain which required continual focus getting frazzled by a brutal sun. I am not sure it was worth it, I was trashed when I got back to camp and all for what, to see some tents on a pile of rubble. 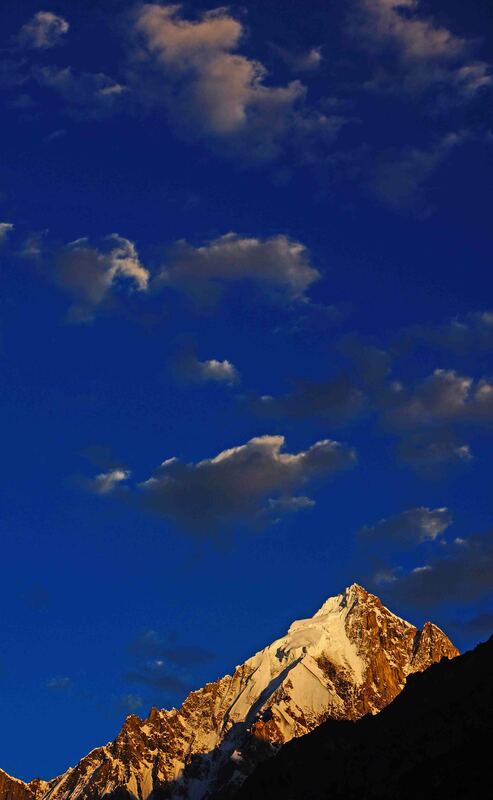 The view of K2 from Broadpeak basecamp is probably better. It was nice to be there watching the almost continual avalanches cascading down the steep lower slopes of Angel peak but I think it would have been better just to walk up to Broadpeak basecamp and be a bit fitter for the trials to come. As it was the group elected to have a rest the next day, which we filled with crampon and rappel training on the steep icebergs next to our camp. Suitably refreshed we rose early next morning, to another cerulean sky, and commenced our journey towards the Gondogora La. Our route took us up the surreal landscape of the Vigne Glacier in almost tangible silence (as you gain altitude and the air thins sound does not travel so well). This for me was one of the best days of the trip, the scenery was outstanding, the walking was easy on nice level rough ice (which meant you could focus on looking at the views) and by early afternoon we were camped at circa 5000m just short of the Gondogoro La. The pass itself looked improbable, it looked like steep snow threatened by a big serac (this was supposed to be a trek after all). That night I bivvied out under the shooting stars and the crisscrossing satellites listening to the constant roar of avalanches coming down from the surrounding peaks wondering what the coming day had in mind for us. 0000hrs (Stupid o’clock personified) I woke up to my sleeping bag heavily covered in frost. I shivered my way out of it and into my clothes, boots, harness and other climbing paraphernalia. Stuffing my sleeping kit away and coffee down my throat I joined the rest of the group on the headtorch illuminated stumbling shuffle across the glacier towards the fixed ropes on the steepening snow/ice. The ropes above already looked like a Christmas tree with early (really stupid o’clock starters) climbers lighting the way ahead with their head torches. The ascent was fairly straightforward, a few 50-degree sections but mostly 30/40 degree slopes on good firm snow. We timed it just perfectly and arrived on the top of the pass at circa 5650m just as the sun was threatening the sky with its presence and bullying away the stars. We lingered there for almost an hour watching the most amazing panorama around us coming to life with the rising sun. K2, Masherbrum, and Gasherbrum 1, 2, 3, and 4 all the usual suspects were visible on the horizon. However we were less than half way there, we still had the long descent into the Hushe valley and the Khuspang campsite ahead of us. We made our way over to the fixed ropes on the descent side only to find a bottleneck of similarly minded trekkers/climbers, half an hour later we were fixed to the ropes and starting our descent. I will not dwell too much on the descent of the GGL except to say it is not easy and is pretty dangerous. The fixed ropes are full of knots and in very poor condition which really slows your progress, the slope is steep (60 degrees) mixed terrain and very loose, the ropes run out at various points leaving you to cross very dodgy ground with considerable drops which are totally unprotected. We, as a result of being held up on the top, ended up being showered with rocks from the melting slopes above. 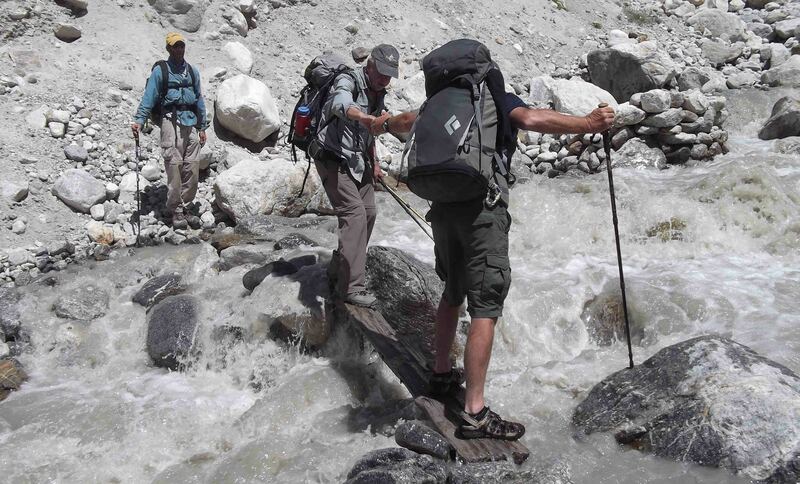 This is not a trek; it requires experience of ropes, some basic mountaineering techniques, confidence and the ability to move at a steady pace on steep loose ground and a considerable level of fitness. Do not underestimate it. By the time we made the more level ground, a discernable path and were no longer in fear of our lives it was approaching 1100hrs, the sun was up and giving us a kicking and we were really looking forward to a level bit of ground and some shade. Khuspang campsite, sitting right under Leila peak (a mountain and a half) appeared out of the mess of tortured ice and rocks like a vision from another world. Flowers, grass, bumble bees and small birds were suddenly in evidence around us, a strange color assaulted the senses, green, it had been over a week since we had seen anything other than white, blue or grey. We could even buy a ridiculously priced cold bottle of coke, which we did of course. Heaven, we ate and then sleeeeeeeept. It would have been normal to take a break here the next day after the trials of crossing the pass but we opted (being the indestructible team that we were) to keep going down to our next camp. The seven hour walk down was fantastic, we followed the Lasermo glacier down passed Masherbrum, down, down, down we went reveling in the rich air and the sights and sounds of a lower altitude and softer land. There was one last kick in the teeth when we rounded a corner to find another insane river over which the bridge had been washed away and replaced by a 10inch wide bit of wood propped on two rocks. The “bridge” was eight feet long, waved washed, slippery and the river (torrent) underneath gave you the distinct impression that a slip and a dip would not result in a pleasant experience that you could tell tales over at your next dinner party. Needless to say we made it and were down in the campsite by early afternoon. We luxuriated with more cold cokes and reflected on our journey whilst we watched the setting sun turn a distant K6 orange. Then it was down to Hushe, the ceremony of paying and tipping the crew and back to Skardu, following a mental Shyock river, by four-wheel drive. Again we were lucky and our flight the next morning arrived, took us on board and deposited us again in the sweatbox of Islamabad. So what of this journey, its generally marketed as a trek, which it is if you do not count the crossing of the GGL. The GGL is not a trek under any stretch of the imagination. It is very steep, dangerous and you need to be strong, fit, and capable of moving confidently on very steep loose ground using basic mountaineering techniques on fixed ropes that are in a dreadful condition. The consequences of an accident on this pass are severe and the likelihood of this happening increases significantly with the number of people trying to cross at the same time as you. The rest of the trek is outstanding, taking in some of the most amazing mountain scenery this world has to offer. The facilities along the way at the fixed campsites are squalid and dirty and much could be done to improve this. I spoke with the Pakistan Alpine Club at the end of the expedition and they tell me they are mounting an end of season tidy up. Why wait? And why allow it to happen in the first place, educate the porters not to chuck litter over their shoulders and crap all over the glacier in the first place. Pakistan and the Karakorum however just blew me away, the people of Pakistan are polite and helpful, yes I know it is more of a mans world and that culturaly Pakistan may not be viewed as being equal in the treatment of the sexes however I was amused to see a large pile of 50 shades of grey on open display in the bookshop in Islamabad. 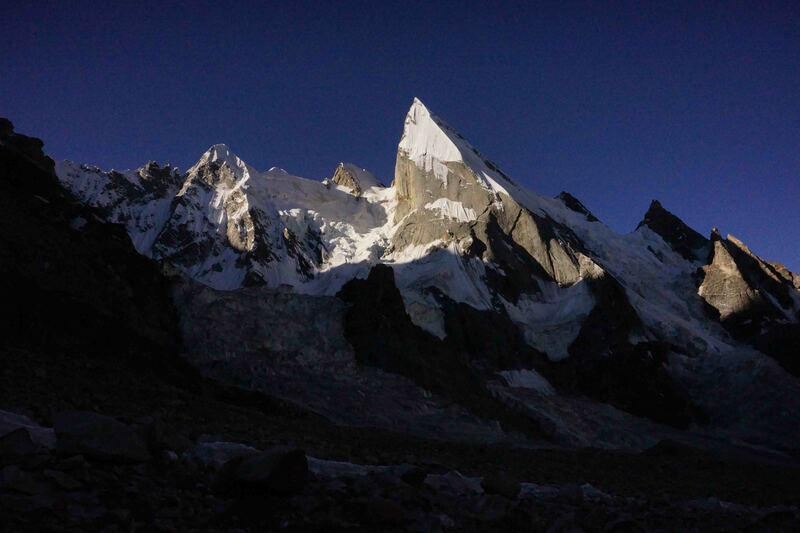 I cannot wait to go back and am organizing a trip to either Spantik or an unclimbed circa 6000m peak for 2014. Watch this space. I did this trek with an American, so it is not impossible. Hi Chris, I am due to be doing this trip with a group in July this year and wondered if you’d be willing to share any advice on gear? Hi! I am heading here in the fall. Wondered what time of year you went and all up how many days you would recommend? Say if I did bus from Islamabad and back? And do you have any recommended guides? I was thinking of just finding one when I got there as I never plan ahead… thoughts? amazing account and pictures. Your crossing of GGL really sent chill to my spine. Any stomach upset issues? Will you guide another expedition over GGL again? Thanks.